Most Reverend Nicholas DiMarzio, Bishop of Brooklyn, regrets to inform you of the death of Mr. Settimio D’Accordo, brother of Deacon Frank J. D’Accordo, a permanent deacon of the Diocese of Brooklyn assigned to the Parish of St. Bernard, Mill Basin, and Deacon Armand C. D’Accordo, a permanent deacon of the Diocese of Brooklyn assigned to the Parish of St. Francis de Sales, Belle Harbor. Mr. D’Accordo died Monday, September 24, 2018. Editor of Nuestra Voz, Jorge I. Domínguez-López has been promoted to editor-in-chief of publications for DeSales Media Group. The move puts Domínguez-López at the helm of the two award-winning newspapers of the Brooklyn Diocese: the English-language The Tablet and the Spanish-language Nuestra Voz. A Cuban-American editor and writer, Domínguez-López was born in Havana. He studied cybernetics and mathematics at the University of Havana and earned his Bachelor of Arts degree in history from St. John’s University. In the early 1990s, he was one of the founders of the Studies Center of the Archdiocese of Havana, Cuba, and Vivarium magazine, the first independent and Catholic publication in Cuba since 1959. After immigrating to the United States, Jorge worked as a translator, editor and writer for the Education Department at McGraw-Hill Companies. He has worked as a freelance writer, translator and editor for HarperCollins, Simon & Schuster, and Little, Brown and Company among others. In New York, he was the founding editor of Béisbol Mundial, a sports magazine with a monthly circulation of one million copies. For three decades, Jorge has written for newspapers and digital publications (Miami’s El Nuevo Herald, Madrid’s Diario de Cuba and Barcelona’s Penúltimos Días) about Catholic issues as well as Cuban politics, literature and history. Since May 2015, he has been the editor of Nuestra Voz. During this time, Nuestra Voz has become one of the leading Spanish Catholic newspapers in North America, with 51 Catholic Press Association awards, including second place for Spanish Publication of the Year, Best Spanish Editorial Page and Editor of the Year. Nuestra Voz has evolved from a monthly print newspaper to a daily online source of Catholic news in Spanish with an international audience. Recently, Nuestra Voz became the most followed page among the Brooklyn Diocese social media pages. Domínguez-López regularly appears on NET-TV’s Currents News to provide analysis on breaking news stories and during live coverage of papal trips. He is the co-host of Al Pan, Pan, a talk show with Father Tomás del Valle on NET-TV. Jorge is also a member of the Academy of Cuban History in Exile. In addition to Domínguez-López’s new role, Formica announced that long-time reporter for The Tablet, Marie Elena Giossi has been promoted to managing editor. Giossi reports to Domínguez-López, and assists him in overseeing the day-to-day operation and production of the newspaper. Giossi is a Brooklyn native and joined The Tablet staff in 2003. She started as the youth editor and has assumed greater editorial duties through the years. Highlights of her Tablet career include covering two papal visits to New York, 2008 and 2015; two World Youth Days, Germany, 2005, and Australia, 2008, and the National Catholic Youth Conference in Ohio, 2007. Giossi says she is proud to have been part of The Tablet teams that won Catholic Press Association Awards for Newspaper of the Year, Best News Writing, Best Reporting on Teenagers, Best Coverage of World Youth Day, Best Coverage of the Year of Mercy and Best Coverage of Mother Teresa’s Canonization. Previously, she was the health editor and a staff reporter at The Brooklyn Skyline newspaper. She has also written for Catholic News Service, the Knights of Columbus’ Columbia magazine and CatholicMom.com. She earned her bachelor’s degree in English from Fordham University, Lincoln Center, and has completed graduate courses in religious education at Fordham. Former editor of The Tablet, Ed Wilkinson will stay on staff as editor emeritus. In his expanded role, Wilkinson will serve as an editorial advisor, he will create a detailed newspaper archive, and he will work directly with Chief Operating Officer of DeSales Media Group William Maier. Together, they are implementing a plan that will reduce bulk newspaper deliveries to parishes by increasing individual subscriptions. Wilkinson will also continue to host his popular TV show On the Block and substitute for Anchor Liz Faublas on Currents News. The Tablet and Nuestra Voz are the official newspapers of the Roman Catholic Diocese of Brooklyn, which also serves the borough of Queens. Combined, they have a circulation of 92,000 newspapers. Please pray for the repose of her soul and for the consolation of her family and friends. May she rest in the peace of Christ, the Risen Lord. If you wish to send condolences, please mail to Deacon Steven Borheck, Our Lady of the Snows, 258-15 80th Avenue, Floral Park, New York 11004. In lieu of flowers, donations may be made to the American Cancer Society. Most Reverend Nicholas DiMarzio, Bishop of Brooklyn, regrets to inform you of the death of Mr. Frank J. Grande, father of Reverend Kenneth Grande, Pastor of Saint John the Evangelist-Saint Rocco (Brooklyn). Mr. Grande died Tuesday, September 11, 2018. Please pray for the repose of the soul of Mr. Grande, and for the consolation of his family and friends. May he rest in the peace of Christ, the Risen Lord. If you wish to send condolences, please mail to Reverend Kenneth Grande, St. John the Evangelist- St. Rocco, 250 21st Street, Brooklyn, NY 11215. 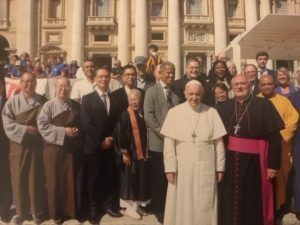 Most Reverend Nicholas DiMarzio, Bishop of Brooklyn, led a group of Catholic and Buddhist leaders from Brooklyn, Chicago, and Los Angeles at a meeting with Pope Francis Wednesday. 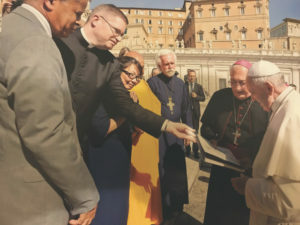 The delegation presented the Holy Father with sustainable projects they are working on that will provide affordable housing to serve vulnerable populations, like the elderly and formerly homeless. 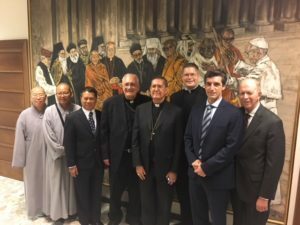 The group, which includes Catholic Charities Brooklyn and Queens, and Enterprise Community Partners, is called the Dialogue of Fraternity. 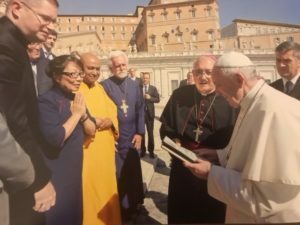 They were tasked three years ago by Pope Francis “to plant seeds together.” Inspired by the Holy Father’s commitment to helping the poor and conserving the environment, the group decided on building Green Affordable Housing Dialogue of Fraternity Projects in their cities. For this project, Catholic Charities Brooklyn and Queens is preparing to develop a 100+ unit affordable senior housing residence with social services that will include a senior center on the ground floor. The new building will be a state of the art green building designed for seniors with “Aging in Place” features and sustainable technologies. Right now the exact location has not been determined. 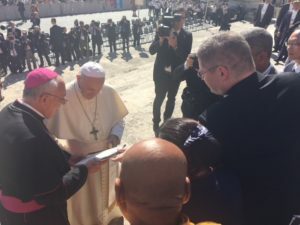 “Our meeting with Pope Francis highlighted three important aspects this delegation has been working on: 1) the need for affordable housing for seniors and the formerly homeless, 2) the importance of sustainable building as stressed by “Laudato Si,” the Pope’s encyclical on the environment and 3) the importance of Catholics to collaborate with leaders of other religions, in this case, the Buddhists,” said Father Patrick Keating, Deputy CEO of Catholic Charities Brooklyn Queens. Catholic Charities Brooklyn and Queens is the largest provider of affordable senior housing in New York City with 25 residences, but that is not nearly enough for the demand. A recent survey of 277 New York City-based senior housing providers found that over 200,000 seniors were on waiting lists for this type of housing. Today a solemn march and Mass will pay tribute to FDNY firefighters and all those who lost their lives in the September 11 terror attacks 17 years ago. Beginning at 10:00 a.m., firefighters from across the country will join New York City’s bravest and families of the fallen at ground zero in lower Manhattan. From there, the group will march 23 FDNY ceremonial flags in single file across the Brooklyn Bridge. Each flag will represent one of 23 firefighters from Battalion 57 in Brooklyn killed in the line of duty at the World Trade Center on September 11, 2001. The journey from ground zero to Brooklyn serves to symbolically bring the brothers back home. The procession will also include an FDNY ceremonial flag for every New York City Firefighter killed on 9/11 and an American flag, in remembrance of all who died that day. 11:45 a.m. The FDNY Mass in honor of the fallen heroes will be celebrated at the Co-Cathedral of St. Joseph at 12:00 p.m. by Reverend Monsignor Kieran Harrington. Reporters interested in covering the Mass should contact Adriana Rodriguez at (516) 238-7565. The Diocese of Brooklyn has received the subpoena sent by the New York State Attorney General and we are in the process of reviewing it. We have been collaborating closely with law enforcement for many years and stand ready to work with her office on this investigation. In 2002, the Diocese of Brooklyn handed over all allegations of sexual abuse of a minor by a priest or deacon, to the district attorneys in Brooklyn and Queens. Since that time, we have adopted a zero tolerance policy and have reported any and all allegations of sexual abuse to law enforcement.